1997 WAS A GOOD YEAR! Well the holidays are here and everything has gone pretty smoothly for the year. One of the best things about the year has been the first flights. You saw in the last issue that we had four first flights. Tom Moore, Jerry Marstall, Paul Spackman and Al Kittleson all braved the skies in an airplane that they built themselves. It took these guys a long time to finish their planes. They are living proof that if you stay with the project it will get completed. I'm sure the story on all four projects has its own twist or two. After we hear about their first flights, maybe they will give us some insight as to how they kept going all these years. Building their planes was really the easy part. It was maintaining the drive and motivation that they really had to work hard at. Staying motivated is the key to making that first flight and beyond. It's not the big problems that get you, it's the little problems that you inflate into big problems. Wiring the electrical system on a plane for the first time can seem overwhelming. It's not a big project; it is a lot of little projects. If you break it down into different groups and then do those groups one wire at a time, it really gets pretty easy. That's one of the nice things about wiring. You can go out in the garage and run one wire and you've made headway. You don't have to do that job again. The little jobs seem so hard until you actually get your hands on them. When competed you wonder what all the fuss was about. The hardest thing to do in each new challenge is taking the first step. That's why getting into a regular groove with your project helps so much. If you keep your thoughts on the project you will nibble away at these problems and each one will be done before you know it. It is like the mouse that ate the elephant, one bite at a time. If you haven't worked on your plane in a while, it's hard to get started again. Take that first step, go out in the garage and see what's going on. Then pick just ONE item and get started on it. Then pick another, and another and guess what? The four guys above are proof that you can eat an elephant. One of the best pieces of advise I could give would be to keep a running list or outline of what you need to do. Each task that you have listed will need to have certain materials available to perform that task to completion. Review each task and inventory these items. If you're missing anything, start a "NEED TO ORDER" list. Make sure you have what you need before you get started. Having everything you need before you begin helps to stay focused on each task. Your list can also be taken to air shows that have a fly-market. Be careful here though. I've bought several items that will forever gather dust in my garage because it was not right in some way. Another thing to do is to know what your current inventory is. What purpose does each part have? If you find parts that you're not sure about, determine their purpose. The more light you shine on your project the more comfortable you'll feel about it. Another way to help your work load and improve the chances of you getting in the air is to cut your wish list down. Do you really have to have all of those gizmos? This doesn't mean you can't add those creature comforts later, but do you have to have them on the first flight? If you've made up a list of things left to do, go through it again. What could you live without until later down the road? Mark items that must be done for the first flight. This has three major advantages. One, it saves time, A LOT OF TIME. Every time you vary from the plans the clock adds days and months and even years onto your project. Everybody adds extras; the point I'm trying to make is that you might want to hold off on some of them. Two, cutting the list down saves $$$$$. Gismos do cost the bucks and sometimes it is better to fly the plane so you can get a better feel for what items you really want (or need). Third, well the third item you could write a book on. Which means we will save that one for another time. Anyway, as I said, it's been a good year. P. S. I need to have articles sent in for the newsletter. A complete builders list of all of the QBA members will be included in the first issue of 1998. 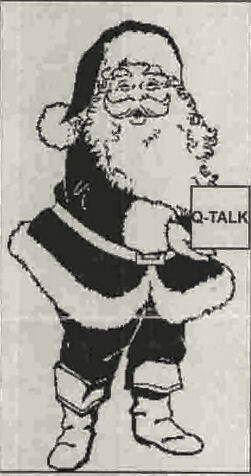 You can order a PDF or printed copy of Q-talk #66 by using the Q-talk Back Issue Order Page.